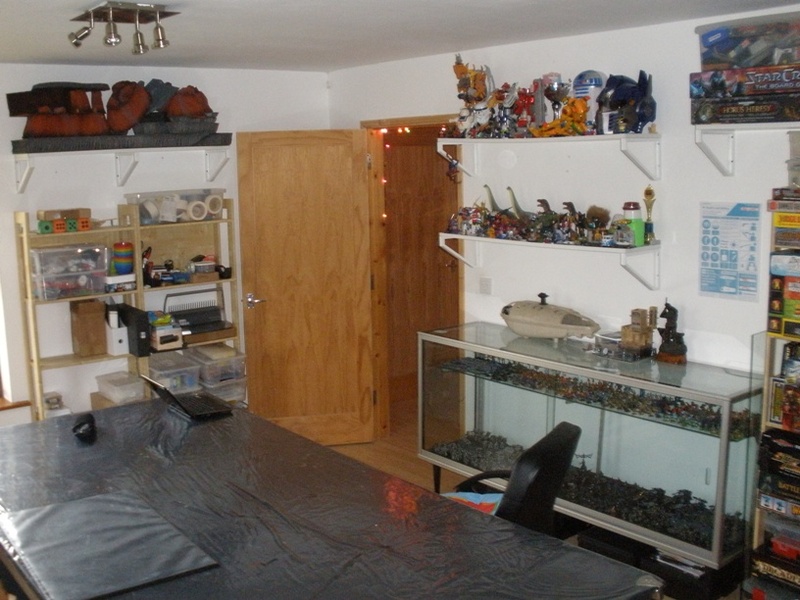 I finally got my hobby room tidied up and functional again on Xmas eve. It was driving me nuts because of the state of it for the last couple of months. Many if the items on the shelves need to be rearranged a little, into some sort of order but that can wait. For now at least the room is operational again. 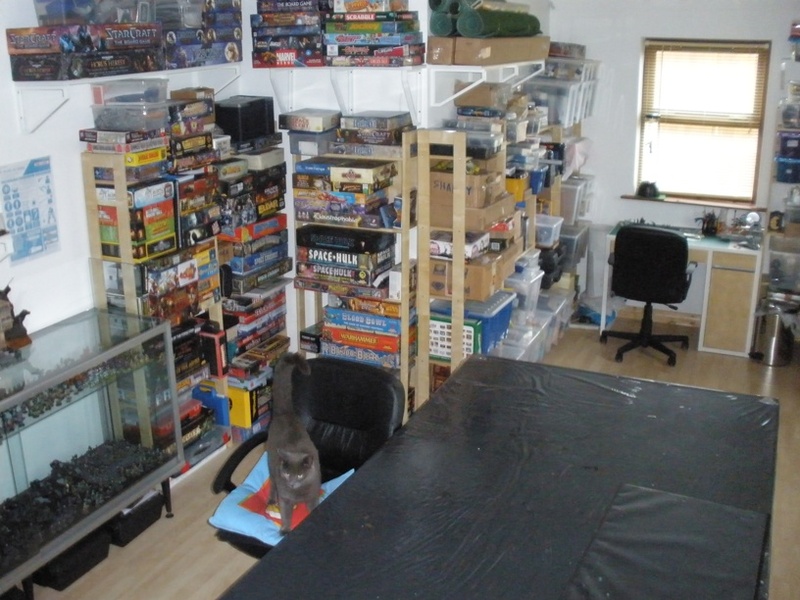 A knock on effect of this de-cluttering was that some actual miniature painting was completed over my Xmas break. This was somewhat satisfying as I havent managed to finish painting a figure since last August. Assuming that I get a half decent chance to take a few photos over the next while I will be able to start regularly posting here again. The posts are all written, I just need to get the photos sorted. That’s really cool Paul! I too have upgraded the ol’ “cavernes des hommes” or whatever it might be in french. =) No pics, but a teaser in my new years blog post. Take care, nice to have you back! Anyway, your new place looks great. Good luck with it. If I can get decent enough weather to take a few photos over the weekend the I will be able to get things posted up here regularly again. I must look into setting up an indoor photo booth sort of thing, although it feels like it will be a lot of effort and that it will take up a lot of space. I do all my photographs indoor, after dark usually. Works well enough for me. =) No fixed setup, I move some lamps up to my gaming table and fire away with a backdrop in place. Same here. My massive photo setup consists of a cheap Ikea desk lamp, a bright white energy-saving bulb and a cardboard box with a printed blue photo background taped to it. When I’m not taking photos, I just chuck the box somewhere, the lamp gets use anyway. 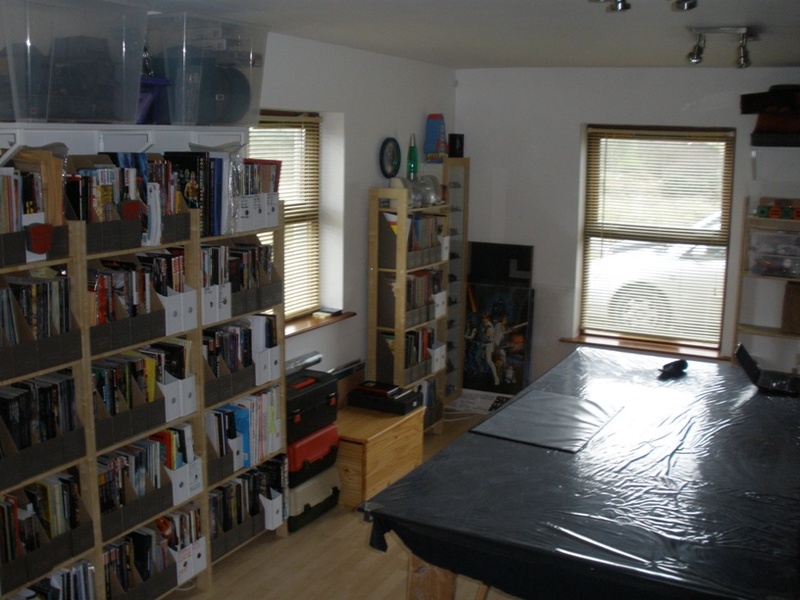 Severe case of man cave envy here, that looks great! Looking forward to new posts from you, and congrats on getting back on the painting wagon. Thanks Mikko. Having a pretty decent man cave is a very satisfying feeling. There is plenty more that I could do to it if I had more time, motivation and crucially cash but I am not complaining: I am very happy with how it is now. The painting wagon was particularly rough to remount this time, even though it always tends to be cyclical. The downtime does seem to have had a deleterious effect on my painting though: I feel quite rusty. It will show a little in my upcoming figures think. Its still better to be working on stuff to a poorer standard than simply doing nothing though. I suspect that the standard will crawl slowly back up in time. Holy……. This looks prettty good mate! Well done indeed! Now to paint more miniatures and have some battles!!! Finding motivated opponents willing to make the effort to schedule some games is getting more difficult for me as the years go by. Hopefully I will get some games scheduled for 2012 soon but as yet no luck. Boo. I find that painting miniatures is an end in itself but I do always paint my stuff with playing games in mind, never for display or anything like that, Not playing much wont stop me painting, but I would enjoy more regular opportunities to game with the painted stuff. Ho hum. @ Mattias and Mikko: I will try to get some indoor photography working over the weekend. I have always had problems with shadows before. I think that I may require a second lamp to sort that out a little better. I will see what I can manage.